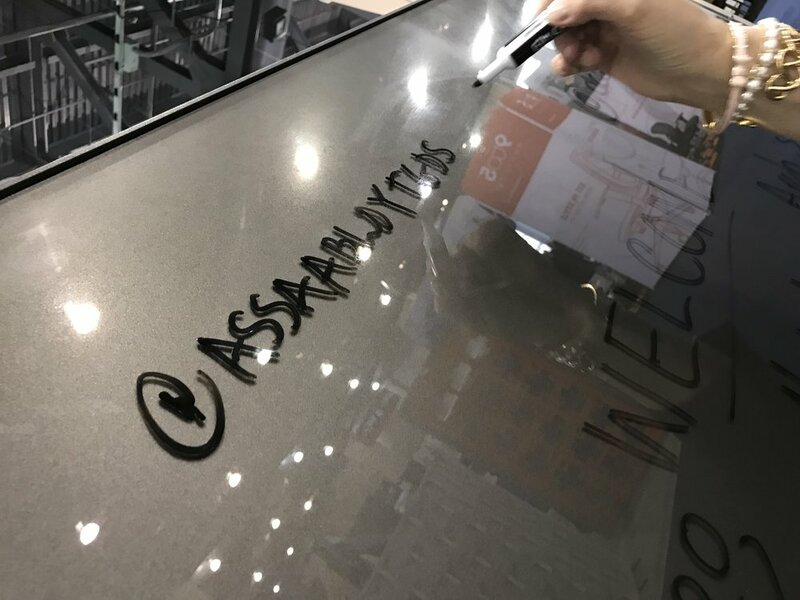 INSPIRATION FROM THE SHOWROOM FLOOR - LIVE BLOGGING FROM NEOCON EAST 2017! Day two of NeoCon East 2017 is here and I was finally able to sneak away from our ASSA ABLOY Mobile Showroom to cruise the show floor. I blogged previously about the importance of NeoCon East as a means for collaborating and sharing ideas with our architectural and interior design “inspirers.” But there are LOTS of ways to be inspired at this show, and that includes by other manufacturers. Great as it is to be ASSA ABLOY, it’s not all about us! Collaborative workspaces: Framery and Emagispace both presented their takes on sound controlled, in-office collaborative meeting spaces. These “quiet pods” cocoon occupants and block sound, permitting private meetings and discussions in the midst of open floor plan workspaces. Genius! So well done, and so necessary. And, note to self, our Rockwood door pulls and decorative door levers would look amazing on these pods! Global displayed some incredibly creative, upholstered chairs that form a privacy barrier around their occupants, and are hard wired to provide power. Loved these chairs aesthetically, and they sat well, too. Glass boards: I love the idea of getting away from the white board and using more stylized and well-designed glass products as creative drawing spaces. They’re mobile! It’s a simple and smart upgrade that really changes the look, feel and functionality of our working spaces. Clever and beautiful! Colors: Several companies displayed unique color options in office furnishings, demountable wall systems, acoustic panels and lighting fixtures. But for all the depth and richness of these offerings, I found myself enamored of the bold primary colors I saw in desks and office fixtures. Primaries are always at home in K-12 and pediatric “kid” spaces, but there’s no doubt about the fact that they enhance the experience of adults in professional work spaces, too! Older PostGRATITUDE TO "OUR INSPIRERS" OF GOOD DESIGN - LIVE BLOGGING FROM NEOCON EAST 2017! Copyright © 2016, ASSA ABLOY Sales and Marketing Group, Inc., an ASSA ABLOY Group company. All rights reserved. Reproduction in whole or in part without the express written permission of ASSA ABLOY Sales and Marketing Group, Inc. is prohibited.